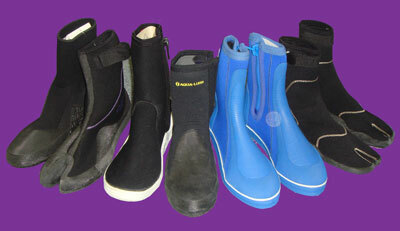 As a pioneer supplier of neoprene in Australia, we offer the widest choice and best quality neoprene rubber products. 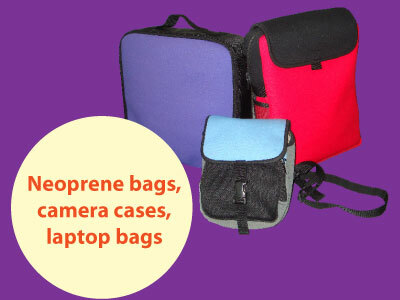 With all that, just imagine what neoprene can do for your product! Sheet sizes may vary depending on finish and type of rubber. Neoprene is sold by the sheet and usually with a variety of finishes to enhance its properties such as textured fabrics, embossed patterns for non-slip, aero slipstream for low water resistance and printable fabrics. It is thus convenient to think of neoprene as comprising 3 layers. 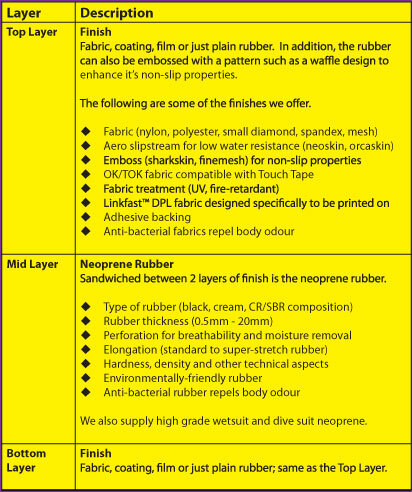 Below is a summary table of Neoprene Rubber and Neoprene Finishes. Neoprene Finish refers to the combination of the top layer (outerwear) and bottom layer (lining) that you can laminate on your rubber. For more information, please refer to our Neoprene Finishes page. Together with an abundant array of neoprene rubbers and thicknesses available, it can be hard to nail down the one you want. That’s where we come in. We help you translate required physical properties into specifications such as type of rubber, hardness, composition, elongation, warp/weft and other technical talk. We know our neoprene. Period. If you would like to know how the sun, the water, the heat and comfort determine the choice of neoprene, just give us a call on +61(3)9763-1111. We also offer pattern cutting and assembly service. Please read on for more information. Does it need stretch? If so, how much? What water depth is the product specified for? Will the material be next to the body? Will it be out in the hot sun all day? Which fabric is compatible with the rubber’s physical properties? 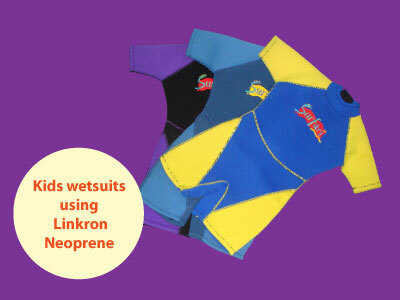 The air in the neoprene acts as a temperature insulatlor ideal for protecting the body from the cold. As neoprene is fairly impervious to water, it is also the ideal material for making wetsuits, divesuits, fishing waders, gloves and other protective apparel. There’s nothing worse than a stiff wetsuit. As material experts in neoprene, we will help you pair the right rubber with the right fabric. It is essential to get the perfect pairing to achieve comfort and stretch at the desired water depth. which neoprene is right for me? Armed with the knowledge above, it can still be a daunting task to determine which rubber is suitable for your purposes. So call us on +61(3) 9763-1111 and we’ll help you find the right rubber for the job.